Francis Bassett Shenstone (Frank) was the first of Henry and Ellen’s children to survive early childhood. He was born on May 10th 1879 at “Warren’s Ye Olde Bush Inn”, 5 miles (8 km) south of Bullsbrook Hotel, or about 34 km north of Perth. Why was he born at the Bush Inn? His father Henry Conquer was managing “The Serpentine”, which was described as a cattle station in this region. Ellen’s parents were known to be living at the Bush Inn from a newspaper notice placed by John Truslove stating he intended to apply for a Wayside House License for the “Bush Inn” situated at the Upper Swan, Gingin road. Ellen’s next two children were born in the area and survived one or two days. This was the catalyst for Ellen to demand that the family to move “to civilisation”. Initially they moved to Perth where in 1881 Frank’s sister Ada was born. By Frank’s third birthday (1882) they were living in Fremantle where Frank’s brother Henry was born. 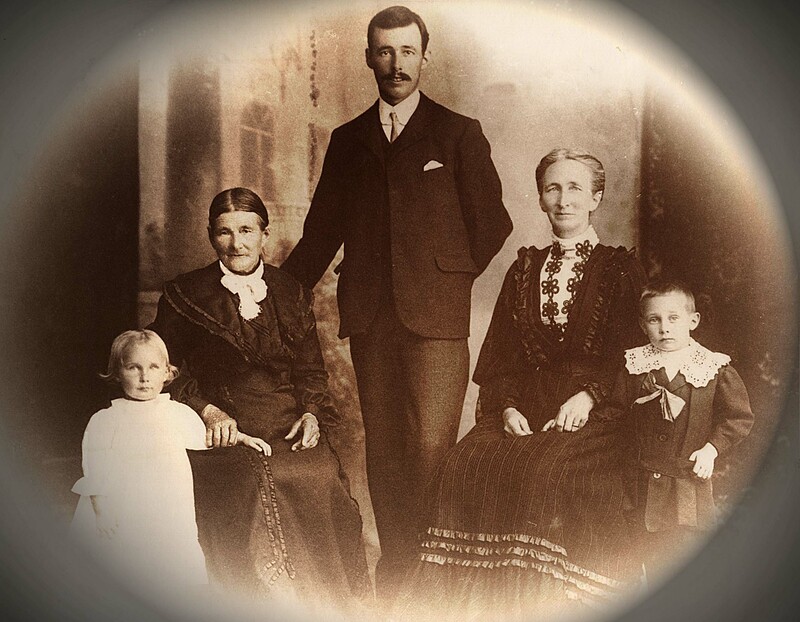 In 1887 Henry Conquer took a position with the State Government on the “outside staff” of the Customs Office at Fremantle and the Flindell Family became firmly anchored to the Beaconsfield/Whitegum Valley area. It is not known at which school Frank began his education. As the births of Thomas and Albert were registered in the district of Perth, of which Wanneroo was a part, Frank probably started his education in the Wanneroo district. The family moved to Fremantle in 1887 when Henry took a position with the Customs Office. Most of the Flindell children attended Beaconsfield Primary School, but as it was not founded until 1890, Frank probably did not. Another option would be one of the private schools run by such people as Mr Briggs who resigned as headmaster of Fremantle Grammar in 1886 to run his own school. Fremantle Boys School opened in 1855 and it seems likely he continued his education there. We can say with certainty that Frank attended Fremantle Boys School in 1892, where he and his brother Henry gained a General Proficiency award. A newspaper article mentioned awards to James Scott, Edwin Shaw, Frank Flindell, and George Innes (full time, one year); and Henry Flindell and David Scott (two years). Ellen and Henry valued education and they would have encouraged their children to attend school and study. What level of education Frank attained is not clear, but it was sufficient for him to gain office employment. At least for the larger part of his working life, Frank was employed by Willshire and Feely at 15 Pakenham Street near Leake Street, Fremantle. He started as a clerk, possibly in accounts, and later worked as a commission merchant and wine and spirits agent. Representatives of Penfolds Wines and Seppelt Wines attended his funeral and laid wreaths. It is not known how or where Frank met Sophie Martin. There are references to a close and longstanding friendship between Henry Martin and Henry Flindell. This may be related to the period between mid-1860s and mid 1870s when Henry Conquer was droving sheep and collecting sandalwood in the Canning and South West, but this cannot be validated. A quiet wedding took place on Wednesday July 3rd at the Anglican Church Kelmscott, between Mr. Francis Flindell of Fremantle, and Miss Sophie Martin, third daughter of Henry Martin of Kelmscott. The bride wore a dress of soft grey material, with white cream silk tucked front, with a hat to match, and carried a bouquet of white flowers. The bridesmaid, Miss Ada Flindell, sister of the bridegroom, wore a pale grey dress, with white silk tucked front, black hat trimmed with black and white tips. The ceremony was performed by the Rev. Swithin Asquith. After the ceremony the bride and bridegroom drove to the home of the father of the bride, where a wedding breakfast was served. Subsequently the happy couple left for their home in Cottesloe. The presents were numerous. He was a member of the Astrea crew. A photograph of the Astrea shows L. Curran crew and secretary. Curran worked for Seppelt and Son and it is possible they funded the yacht. Willshire and Feely were agents for Seppelt. The crew was known as The Birds. In 1920 Frank had a health problem and was being treated in Fremantle Hospital. Family lore has it that he checked himself out and walked home to Whitegum Valley and got caught in the rain. There are a number of versions about why he was in hospital and why he checked himself out. A common suggestion is that he had Glandular Fever or Mononucleosis. Mental depression is common with glandular fever and this could explain why Frank checked himself out. Some family elders referred to his deep concern about what may have been happening at home. The outcome was that he caught a chill, which developed into pneumonia from which he died on December 11th 1920. 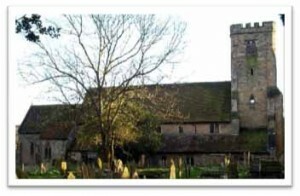 Henry Martin was born in 1801 and baptised on June 9th 1801 at Salehurst, near Robertsbridge, East Sussex, England at the parish church, St Mary the Virgin, pictured right. Life was still hard in England in the 19th century. Queen Victoria’s reign was the peak of the British Empire. Children worked, particularly in rural areas, but they also had time to play and learn. The Victorian era was a time of change for children. The promise of a new life in the Colonies was promoted, some would say overstated, by the government. The Martin family was probably the norm and the promises of the Swan River Colony beckoned. They became part of the two hundred forty two passengers who emigrated from England aboard the “Simon Taylor”. The ship set sail from London on April 30th 1842, under the command of Thomas Brown. Of the 242 passengers just five had cabins. The rest travelled in steerage, or the lower open decks, where ablutions and privacy were lacking. There were 219 assisted migrants, which included the Martin family, and eighteen Pankhurst Boys. Although convict transportation did not start in the Swan River Colony until 1850, boys aged fourteen to eighteen serving jail sentences in Pankhurst Prison were sent to the Colonies for rehabilitation and to be apprenticed to local settlers. Almost all of the passengers of this voyage spent some time in quarantine (from three to sixty one days), including the Martin family for four days. Strayed from the town herd, on 21st October a small straight horned white and brown heifer, heavily in calf; she has a white stripe down the face, and a large brown mark on the right shoulder. A reward for the recovery of the above will be given on application to H. Martin, Perth. Roads were sparse and generally of poor quality in the early colonial days so the rivers provided the convenient access to the hinterland. The Swan and Canning Rivers were pivotal to the Colony’s expansion. The Martin’s destiny was linked to the Canning, which rises east of Roleystone, winds westerly then north through Kelmscott and the now suburb of “Martin” to be joined by the Southern River to continue north-west through Kenwick then past Salters Point, Riverton and Rossmoyne passing under the Mt Henry Bridge on the Kwinana Freeway then flowing north a short distance under Canning Bridge to join the Swan River flowing west to Fremantle and the sea. Today the Canning Local Government Area is located along the Canning River. “Henry Martin had been carting timber for which there was considerable demand in the growing settlement. Earlier he had carted the timber (by bullock team) used in the construction of the new causeway, the first bridge over the Swan River. The family farmed their property on the banks of the Canning River in Clifton Street, whilst still carrying on this timber-carting business”. An accident occurred on Wednesday last, to the team of a person named Martin, in crossing the Causeway Bridge, when running against the rails on the Bide of the bridge, the rope yarn which fastened it gave way, and the six bullocks were precipitated into the river. Luckily nothing of a more serious nature occurred, and the bullocks were extracted without injury. The undersigned hereby informs the owners of Cattle depasturing upon his run that he will not, after the date of this notice, be answerable for them should they stray off the run. HENRY MARTIN. Canning, April 15, 1851. No Timber of any description to be cut down on the Estate of Rolleston, Canning River, (at present occupied by Henry Martin, as tenant) without application to Mrs. Gregory, or Mrs. Aulini, Perth, Oct. 25, 1853. So far we know Henry needed dogs to manage his land and probably to hunt; he provided agistment for stock; and had a fair size bullock team. In fact Henry, like most other settlers, had to earn money as soon as he arrived. One means was to cut and cart timber for construction. He also made wooden nails or pegs, split sheoak shingles for roofing and walls, and employed his team in any way he could to earn an income, including carting timber for the new causeway bridge. Kelmscott, the Colonial home of the Martin Family, was first settled in 1830. In the same year it was gazetted as a township and a military outpost was established to protect the settlers and manned from the 63rd Regiment. By 1857 Henry had taken up land in the Kelmscott area and in 1858 he was reported as attending a meeting of the “Inhabitants, Land owners, and others interested in the welfare of the Canning District, held the 26th day of April”. The Martin family occupied the wattle and daub building formerly used by the soldiers posted to the area, they having moved to a more permanent building. From old photos it appears that Henry extended the old wattle and daub building and added a verandah. A step forward in the progress of the district came in August 1842, when the sailing vessel Simon Taylor arrived at Fremantle from London with 219 immigrants, a number of whom settled in Kelmscott. Among them was the late Henry Martin, who later occupied the old house built by soldiers until its demolition. He played an important part in the progress of the district, and it is interesting to recall that he carted with bullocks all the poles for the Bunbury telegraph line and also timbers for Rockingham jetty and for an early bridge across the Swan River. He also carted quantities of sheoak shingles from Perth these being used for roofing the early day houses. STRAYED into my herd, about three weeks ago, two bullocks ; one black, branded TW on near side, and S on off side; one red bullock, branded IS on off side, with white face, and white stripe down back. The owner may have the same by paying expenses. HENRY MARTIN. Kelmscott, Canning, Dec. 11, 1856. We are sorry to hear that an old settler named Martin, and his son, resident on the Canning, have been committed for trial on a charge of cattle stealing. Henry Martin, the elder, was again placed at the bar, charged with stealing six head of horned stock the property of William Pearce. The particulars in this case were almost entirely similar to those in the former indictment; the cattle were branded, two with prisoner’s brand M, one WP, and 3 were unbranded. On the part of the defence an attempt was made to prove the property in the two branded M existed in the prisoner, but it failed to convince the Jury who returned a verdict, of Guilty, and he was sentenced to15 years penal servitude. It is not clear whether Henry was a victim of the government’s intention to send a message to settlers about stock theft or not. Up to this time he had been diligent in placing notices in the newspaper, but Henry’s case followed immediately after a similar case for which a guilty verdict was handed down. The jury appeared to reject Henry’s evidence that he owned similarly marked stock. By this time Henry may have wondered if the life of an agricultural labourer in Sussex would have been better for his family than the trials of a new and distant Colony. Perhaps he was able to achieve independence and an opportunity for his children to grow with the country. Friday 16th.-A man named H. McGlean, in the employ of Mr. E. (sic) Martin, met with a serious accident, which unfortunately proved fatal, while assisting to fall a tree on the Guildford road, about 14 miles from Newcastle……Martin, who was present, and narrowly escaped a similar fate, promptly placed him in his trap in the care of two others and sent him into Newcastle. On Saturday an old settler named Henry Martin, of Bedjoording, went out, as was his custom, to look up some of his cattle; but his pony returning in the afternoon rider less some fears were entertained that something might have occurred, but as the pony had returned so before no immediate steps were taken until Saturday night or Sunday, when a search was instituted, but without the required result until Monday afternoon late, when he was discovered lying upon his back dead, with his faithful dog between his legs. It is supposed that immediately after his mounting he had fallen back and died. He was past seventy years of age, and on the previous evening had complained of being unwell. This review of the Martin family focuses on their “Flindell association” as seen in the foll owing diagram. It is for others to tell the wider Martin story. For this reason only the lines of Harriet and Henry Martin Jnr are covered. 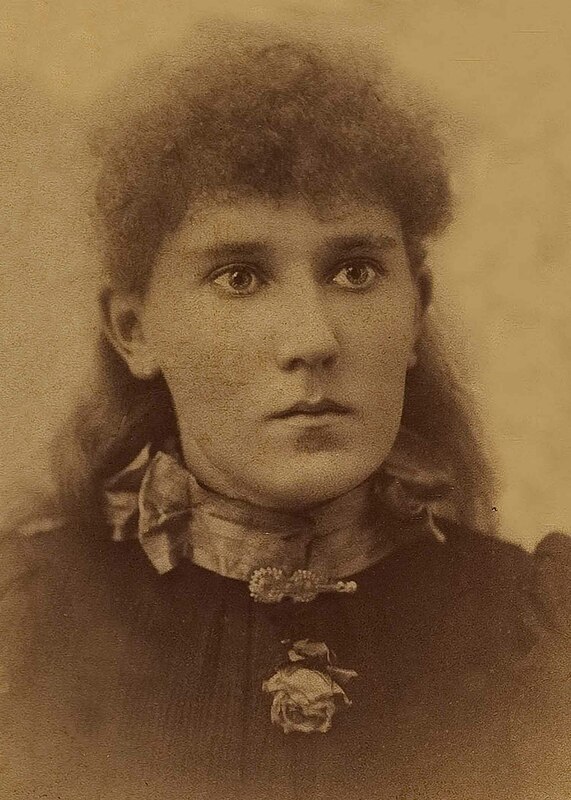 Sophia was born in Perth in 1849 and died in the Katanning in 1933. She married Thomas Fisher at Australind in 1871. William was born in Perth in 1851 and died in the Wellington district in 1921. He married Sarah Anne Fisher in Australind in 1874. She was probably the sister of Thomas. Eliza was born in the Serpentine district in 1853. 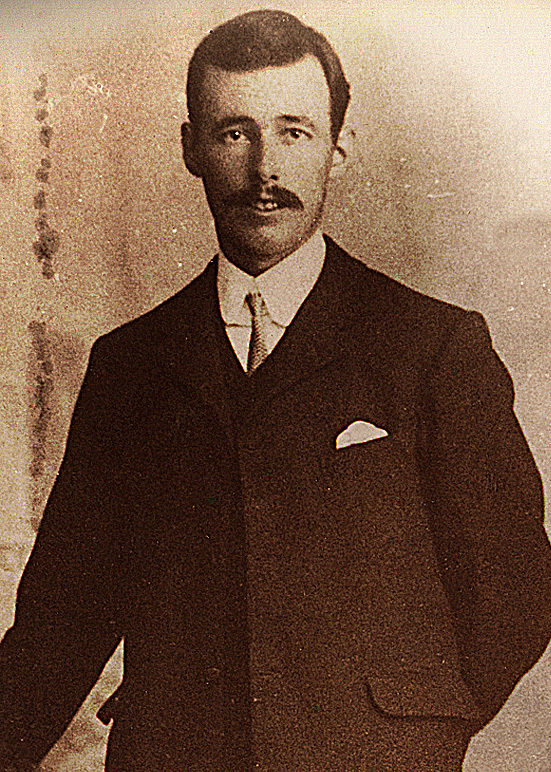 Thomas born in Perth on May 22nd 1855 and died in Kojonup on July 6th 1941. He married Ellen Harriet Flindell, daughter of Thomas Shenstone Flindell and Mary Charlotte Luff, at Arthur River on February 26th 1899. Charlotte was born in the Serpentine district in 1860 and in the Plantagenet district in 1940. She married William Sounness at Hay River in 1876. Harriet was born in the Serpentine district in 1862 and died in 1899. She married Charles Marsh in Albany in 1884. Annie was born at Beaufort in 1865 and died in Perth in 1906 possibly as a result of the birth of Catherine her last child in Bunbury in late 1905. She married John William Stone in the Katanning district in 1896. Sacred to the memory of William John Gibbs who died 18th June 1895 aged 87 years and 7 months. Home at last, his labour done. Safe and blest the victory won. 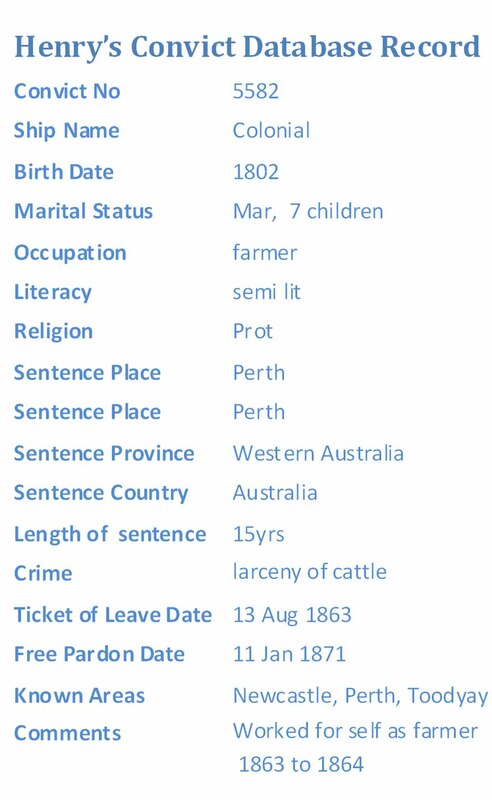 There is a record of Harriet Martin dying in Perth on February 22nd 1896, but this may not be the same Harriet as it states she was born in England (which is correct) and her mother’s name was Harriet (which is not correct); however errors such as this were common. Her burial record has not been found. There is a suggestion that Henry Martin Jnr first “married” an aboriginal woman. Aboriginal ancestry records refer to a Henry Martin, born 1838 in England and died 1920 in Kelmscott who was a non-aboriginal timber cutter for the local mills and a small farmer and storekeeper in Kelmscott, which correlates. 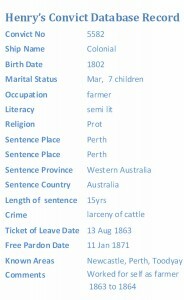 It states he married Sarah (#77965), born in Wongong via Armadale who died prior to August 1899. There was a daughter Sarah Clara Martin (#41666) born about 1864 in Guildford and died February 6th 1912 in the Hospital for the Insane at Claremont. However, this record also notes that on May 23rd 1863 Henry married Mary Cronin (born 1846 and died 1896 the daughter of Patrick Cronin and Margaret Butterfield). It is not known what the status of the first marriage had in the Colonial system of the time, or indeed whether the marriage to Sarah was terminated before her married Mary Cronin. CRONIN Patrick, born 1811 (Ireland), died 3.6.1900 (Katanning), arrived 13.3.1855 with wife and family, married Margaret, born1810 (nee Butterfield). Children: John born 1841 died 1926, Michael born 1842 died 1931, Mary born 1846 died 1896, Ann born 1849, Margaret born 1851 died 1892. Bricklayer by trade. Was an Enrolled Pensioner Guard stationed at Canning as Police Constable in charge of a convict road party, was also at Perth and Pinjarra. 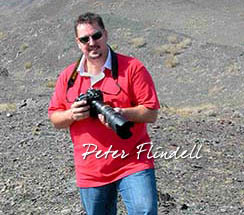 Late in life was with his son and died at “Glencoe” Katanning. Roman Catholic. Justice Department online records have the death of Margaret Cronin in 1870 age 56 and Patrick Cronin in 1900, age 87. There is a four year discrepancy with Margaret’s year of birth based on the manifest and her age at death, but this is not significant. There are a number of newspaper references to Constable Patrick Cronin in the Kelmscott area in 1860. Patrick Cronin was a bricklayer, so without training or experience, how did he become a policeman? The Police Historian suggested that when coach services began between Perth and Albany armed guards were required to carry mail. For a number of reasons including extending the reach of the law, this function was taken on by the police and this was how Patrick enterred the police force based in Kelmscott. James was born at Canning in 1864. No record of marriage or death has been found. Frederick was born at Canning in 1867. Fred did not marry. The record of his death has not been found. Samuel was born at Canning in 1871 and died age 2 in 1873. Eliza was born at Canning in 1874. She married John Hicks in 1906. John was born about 1878 and died in Kelmscott in July 1966. Eliza died in Kelmscott in December 1966. Both are buried at Karrakatta Cemetery, Roman Catholic area, section Lawn 4 grave 266. No validated record has been found of any issue from this marriage and their tombstone does not mention children. Sophie Lucy was born at Kelmscott in 1880. Her story and marriage to Francis (Frank) Bassett Shenstone Flindell is told separately. Elsie who married W. Lucas (registration not found). They may be Elsie May Lucas died at Kelmscott on 20 Jul 1993 aged 75 and William John Lucas who died at Kelmscott on 22 Nov 1990. Both were cremated and their ashes taken by the Administrator from the cemetery. There is an interesting tale regarding Sophie circa 1896. She, like so many girls and young ladies of her day, was a competent horse woman. She helped her parents by delivery their farm produce to customers in the district. On one occasion she was taking recently butchered lamb to Canning Mills, a distance of about 14km. Moondyne Joe, to some a petty criminal, to others a bush ranger, saw her, rode beside her and asked her where she was going. Sophie was about sixteen at the time, but this would not have been a cause for concern to her because Joe was well known in the district, including to her parents and grandparents. She explained her mission and Joe said he would accompany her to see she came to no harm. 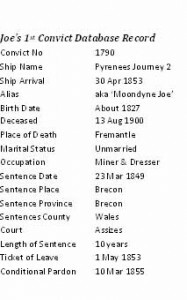 An overview of Moondyne Joe follows. Joseph Bolitho Johns was one of the characters of the Swan River Colony. He was born in the United Kingdom in 1831. Aged just 17, he was charged with stealing. 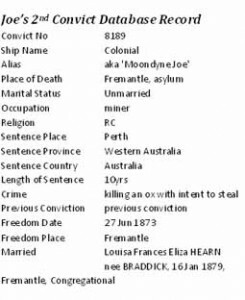 From 1849 to 1853 Joe was incarcerated in various English prisons before being transported to the Swan River Colony. He arrived at Fremantle on Saturday April 30th 1853 aboard the convict transport Pyrenees, was issued convict number 1790 and a Ticket of Leave and the following day sent out to find work. Joe was known to move around the Toodyay, Canning Mills and Kelmscott region. During the period 1855 – 1861 he worked near Moondyne Springs in the Toodyay District, which is perhaps why he became known Moondyne Joe and something of a folk hero. Joe broke the law many times, but some would say that he was a scapegoat, but his ingenuity in escaping from apparently hopeless conditions was what gained him sympathisers. Confirmation of his association with the Martin family was what was called the Ox Bright Incident where he was charged with “killing an ox with felonious intent”. Although he protested his innocence at the trial, and throughout the rest of his life, he was found guilty and sentenced to “ten years’ penal servitude”. Among the witnesses were Henry and Elizabeth Martin. Henry was reported as stating he lived at Kelmscott and had lived there for more than 14 years and that the prisoner (Joe) was at his place when he left to go to Toodyay repairing wheels. It was also mentioned that Cronon (sic) lived a short distance away. There was another incident where a man drowned in the Canning River and Patrick Cronin and Joe recovered the body while third person went for the police. On January 16th 1879 while in his early fifties, Joe married a young widow, Louisa Francis Eliza Hearn aged 26. She was just 40 when she died. Joe lived for another 21 years during which time he was in and out of trouble, but was not sentenced to imprisonment. On January 26th 1900, Joe was found wandering the streets of South Perth and “being of unsound mind,” taken into custody and ordered to the Mount Eliza Invalid Depot for medical attention. If there was an irony, it was that he continued to abscond, his final release coming with his death on August 13th 1900. He is buried in a pauper’s grave in Fremantle Cemetery. Justice Department Records – Marriage Certificate 207 of 1847. Justice Department Records – Marriage Certificate 1979 of 1863. Justice Department Records – Marriage Certificate 3 of 1906 District of Canning. Justice Department Records – Birth Certificate 18328 of 1877. Justice Department Records – Marriage Certificate 33 of 1901. The Western Mail reported that Frank and Sophie returned to their Cottesloe home after the wedding. The birth of Basil, their first child, was registered in Cottesloe. The 1901 Electoral Roll lists them in Fremantle, so unless Willshire & Feely (W&F) had a Perth office, which does not appear to be the case from Post Office Directories of the period, Frank had employment prior to W&F. 1901 Electoral Roll – occupation clerk, Sophie home duties, residence Martha St Beaconsfield. The 1907 electoral records show him as a clerk of Stephen St Fremantle (probably Stevens). Toxaemia is blood poisoning. Asthenia is a general weakness or lack of energy. In babies it may be associated with the mother contracting Toxaemia in the second half of her pregnancy which can cause serious problems for both mother and the baby. Given that Elsie was a few months old this may the cause of death. Henry Martin Snr had a copyhold (cp) house (hs) and garden to qualify to vote. Copyhold is an ancient form of land tenure at the will of the lord of the manor. It is likely he worked for the lord of the manor as an agricultural labourer. Robertsbridge is north east of Salehurst and today is much larger. Although the Census was 1837, her Coronation was not until June 28th 1838. Some records give the name Batcup, but Norma Curnow, a Martin researcher, claims the name was Bateup. This land had been bought by Charles Churchman in the early 30’s, however, he died 2 years later and the property transferred widowed sisters, Dane, Gregory and Aulini. Mrs Aulini arrived in the Colony on the barque Prince Charlie (The Perth Gazette and Independent Journal of Politics and News of Friday 25 October 1850 – Shipping Intelligence).